No ... I'm not pregnant! But my niece was ... until last week ... when she gave birth to the most delicious little daughter called India. She is a very special baby who will be more loved than most people I know. But of course, that might be my bias talking. My niece asked for yellows, greys and neutrals. But I couldn't resist a splash of red! And of course, the baby's name on the back (or the "other front") of the quilt. 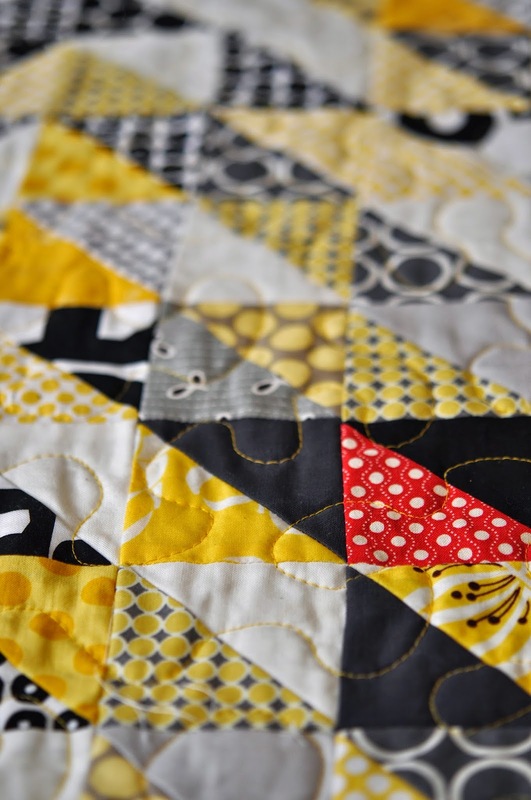 All fabrics from my stash, including the scrappy yellow binding. Already much loved by it's new recipient. Here's some more pics .... just because. Welcome baby India. We love you to the moon and back. What a beautiful quilt and what a beautiful name for a baby. Can you tell me the dimensions of the quilt? I'm in the process of making a baby quilt and I'm not sure if I've made it big enough. That hit of red looks fabulous on your beautiful quilt....I love the idea of putting the baby's name on the back!!! What a gorgeous quilt!! I love the color combination and the other front! I hope you are getting lots of cuddles! Is it that time of year already? ?